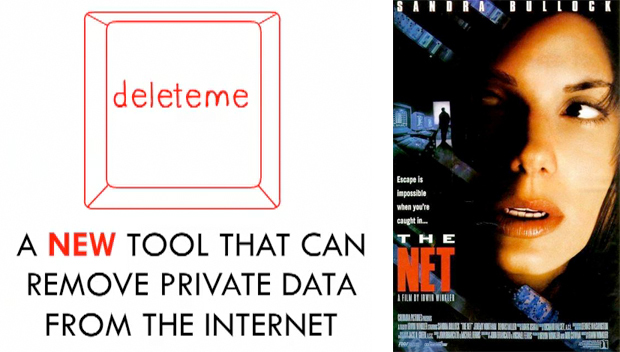 Remember the 1995 movie The Net–when Sandra Bullock frightened audiences with the prospect of having your identity deleted in cyberspace? How times have changed. With the rise of third-party cookies and ads that watch your online behavior, removing embarrassing personal information from the Internet has almost become a holy grail of digital life. Bullock’s situation seems almost desirable in retrospect. Recognizing the growing call for privacy, Cambridge, MA-based online privacy company Abine today launched DeleteMe, a “delete button for the Internet.” Rather than tracking down that ancient Friendster password on your own, users can pay Abine between $10 to $100 (depending on how complicated their history is) to remove photos, blog posts, videos, and search results, delete old accounts, and stop companies from selling private data to advertisers. The process is not entirely automated. Abine staffers will do much of the leg work, taking advantage of privacy regulations and firing off emails and faxes to unresponsive networks. Abine’s DeleteMe service follows a push by the Federal Trade Commission for more transparency and privacy controls online. Several weeks ago, the FTC proposed a “Do Not Call” registry for the Internet, which would essentially provide users with a universal opt-out button to stop advertisers from tracking Web-surfing habits. But Kuznetsov says the FTC’s proposal would only protect your information going forward–it does nothing to remove the personal information already online. That’s where DeleteMe can help. While Abine can’t promise that all user data can be deleted from the Internet, the company does offer a money-back guarantee to those who are too exposed online for the company to cover their tracks.